Are you looking for something a bit adventurous for your kayaking trips? Want more excitement rather than a leisurely paddle along a slow-moving river? If this sounds like you need to consider whitewater kayaking. Beginners find kayaking to be a bit tricky due to the double-sided paddle and the kayak’s shape and size. Finding the best whitewater kayak for beginners will help make your next kayaking adventure less tricky and more enjoyable. Here is a quick comparison of key parameters of the top whitewater kayaks ideal for beginners. How do you Start a Whitewater Kayak? What are Whitewater Kayaks Made Of? 1. What is a Whitewater Kayak? 2. What to look for in a Whitewater Kayak? 3. Is one Brand of Kayak Better than Another? 4. What are the Different types of Whitewater Kayaks? 5. How do I get Involved with Whitewater Kayaking? 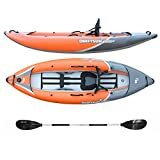 The most important things to consider when choosing the best white water kayak include similar things that you would look for in a beginners kayak, as well as the length, width, and depth of the kayak. Whitewater kayaks are specially designed to handle the challenges kayakers face in rougher and faster waters. If you are even slightly considering going whitewater kayaking you will want to make sure you invest in a whitewater kayak. This will ensure your kayak stands up to the adventure, but will also help you enjoy your kayaking experience as much as possible. Choosing the best whitewater kayak for beginners is quite similar to choosing the best kayak for beginners. 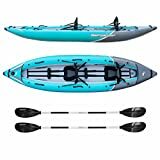 You will want to look at many of the same things when selecting a whitewater kayak as you do when selecting a beginners, including the features that the kayak comes with, whether the kayak is made from ABS or polyethylene, how portable the kayak is, how comfortable it is to ride in, and how much storage the kayak offers. How long of a kayak you choose for your beginner’s whitewater kayak is extremely important. One thing to keep in mind with the length of the kayak is that the longer it is the faster it can go through the water. Compared to shorter kayaks, the longer ones can be paddled more efficiently at higher speeds, but they don’t turn as fast although they do track straighter. The deeper kayaks sit higher in the water because their hulls are above the water line. These deeper kayaks are a good choice for a beginners whitewater kayak because they offer more room to stretch out and have plenty of legroom. The downfall to the deeper kayaks is the profile of the hull is higher so they can easily be caught by the wind. How wide the kayak is will also need to be considered. A wider kayak offers better rotational stability. For those who are afraid of tipping in their kayak wider boats are also easier to get in and out of. The problem with the wider kayaks is they slow you down as they create more friction and drag when cruising through the water. The added drag and friction creates more work for kayakers, as you have to put in more paddling to maintain the desired speeds. When it comes to the best whitewater kayak for beginners a few different boat designs will work. Most whitewater kayakers prefer a freestyle boat or a river runner. The boat design you want to purchase will really depend on the type of kayaking you will be doing. River runners are excellent boats for long trips and easy to intermediate rapids. Freestyle boats are great for building your kayaking skills. The best part is both beginners and experts can use the same boats; beginners can easily grow and learn with the kayak that they have chosen. To get started in whitewater kayaking you will need to purchase five pieces of gear that are essential for whitewater kayaking. In order to start whitewater kayaking, you need to make sure you have the appropriate kayak. A recreational kayak will not hold up to the water conditions you will face in whitewater kayaking. You also want to make sure you have a good paddle, the right size spray skirt for your whitewater kayak, a PDF, and a helmet approved for use in water sports. And, remember you never want to kayak alone, so join a whitewater club or bring along your own friends. Whitewater kayaks are often made from a strong plastic so they are durable enough to withstand the abuse of the rapids. Whitewater kayaks can be made from different materials, but you want to find something tough and durable enough to withstand the abuse of the rapids. Several years ago whitewater kayaks were mainly made of resin and fiberglass composites. Today, whitewater kayaks are built using tough plastics, unless the whitewater kayak is intended for racing. The plastic is not indestructible, but is tough enough to stand up to the rapids and requires very little in terms of maintenance. There are several brands known for the best whitewater kayaks: Dagger, Wave Sport, Jackson, Liquidlogic, Pyranha, Bliss-Stick, Riot, Sea eagle, and Prijon. Today over 95% of the kayaks that you see out on the rapids are plastic whitewater kayaks. With how popular whitewater kayaking is it makes sense that the top brands are updating designs and features to offer kayaks the next best thing. Here are the answers to the five most commonly asked questions on beginner whitewater kayaks. A whitewater kayak is a specially designed kayak for whitewater. These kayaks are not recreational kayaks and are designed to handle the abuse of the rapids. When looking for a whitewater kayak you need to think about the water you will be paddling in. Easy to intermediate rapids are well suited for a river-runner or play boat. Longboat or creekers are better suited for rougher waters. One brand of whitewater kayak is not necessarily better than another. The biggest difference between kayak brands is simply personal preference. Kayakers have the choice between long boats, creekers, river-runners, and play boats. A long boat can measure up to 12 feet and are extremely fast downriver. Creekers are the largest option and are built to handle waterfalls and rough rapids. River runners are built for going fast but are the most versatile option. Playboats are the shortest of the group of kayaks and are made to surf waves. The easiest way to get started whitewater kayaking is by joining a local club. You can also opt to take lessons from a qualified instructor or simply grab a few friends and hit the rivers together. The important thing is to never go out alone on the rapids. If slow paddling on a lake isn’t your idea of fun, then whitewater kayaking is the sport for you. It is a great activity for people looking for more adventure during camping or hiking trips or even as a standalone sport. When looking for a good whitewater kayak, it needs to be sturdy so that it can take on rapids as well as extremely stable and safe. Maneuverability and responsiveness are also important factors so that you can change directions in the rapids easily. Keeping in mind these factors as well as popularity and customer ratings, this list has the 7 best whitewater kayaks, with both inflatable and hard-shell varieties. Most inflatable kayaks aren’t built to handle whitewater, but the Sea Eagle SE330 is an exception: it can handle both still water and whitewater up to Class III. It is up to these conditions because of its rugged, puncture-resistant PolyCrylar construction, high frequency welded seams and inflatable I-Beam floor that give it both rigidity and comfort. Despite being puncture resistant, it takes safety into account through its multiple chamber construction. This ensures that in case one chamber gets punctured, the remaining chambers stay inflated and keep you afloat. This can be a lifesaver for beginners and experienced kayakers alike. It is designed for tandem kayaking and comes with 2 removable, inflatable seats and has a weight limit of 500lbs. 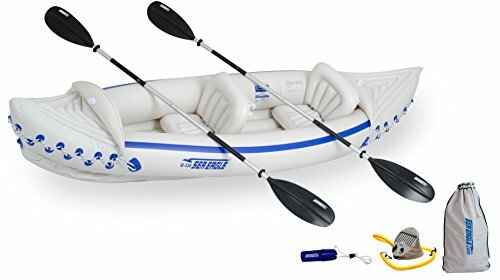 This makes it a great kayak to introduce kids to whitewater kayaking since it is spacious one for one adult and one child. It also has spray skirts which keep you from getting completely drenched. Other accessories that come with it include 2 oars and a foot pump to inflate it. It also comes with its own carrying bag which makes the SE330 easy to transport, especially since it weighs only 26lbs when folded down. 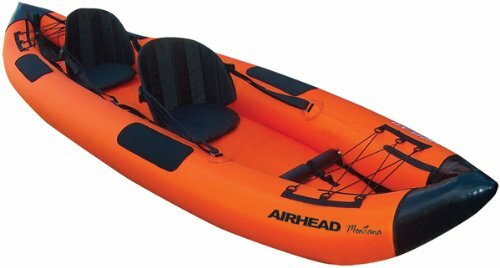 The second inflatable kayak on this list by Airhead, is also a tandem model and is a great option for those who need to travel a lot to get to a decent kayaking spot. It is made for both regular lakes moderate whitewater. It is made of semi-rigid heavy-gauge PV and is divided into 3 air chambers for safety, in case one gets punctured. All 3 chambers are enclosed by a UV-resistant and water-resistant nylon covering that makes them suitable for rugged use. The entire body of the kayak is colored bright orange to make it highly visible. 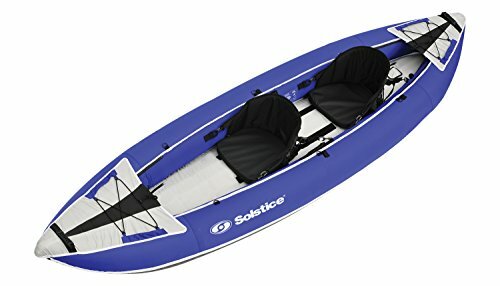 While most inflatable kayaks tend to be slower and drag more in water, this one has 4 bottom fins to make it responsive and give it superior tracking. To improve your overall experience, it has adjustable foot braces for kayakers of all heights, 3 Boston valves for easy deflating and inflating, and grab handles that make it easy to pull in and out of the water. It also has neoprene elbow guards for added comfort. For storage, you get D-rings to attach equipment at the bow and stern and a stretch net for cargo positioned at the bow. This kayak has a weight capacity of 500lbs and weighs 36.3lbs when deflated and comes with its own padded shoulder carrier. 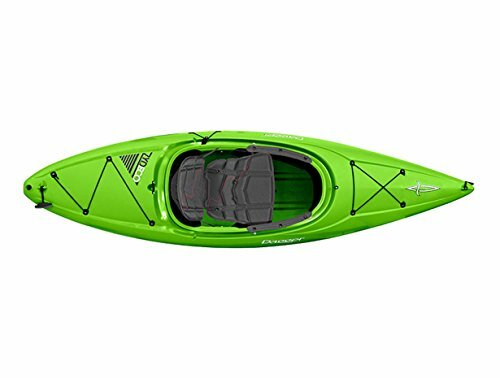 The Zydeco 9.0 is a popular hard-shell kayak to take on whitewater in slower rivers and inlets, an ideal environment for beginners to start in. What makes it so popular, along with its many impressive features, is that is costs half as much as other hard-shell kayaks on the market, which makes it a good investment for beginners. It has a compact 9-foot long design that is meant to make it easy to maneuver in tight spaces. This also makes it lighter, which is easier for cartopping and carrying. In fact, at 36.5 lbs, it weighs as much as the Airhead Montana, which is an inflatable. The cockpit design remains spacious despite the small dimensions of the kayak while the CSF-R seating is adjustable for a perfect fit to maximize your comfort. The seats are made of soft contoured foam and the backrests can be adjusted. The special SlideLock foot brace not only keeps your feet in place but also promotes a better rowing posture, which is great for less experienced kayakers. Other convenient features include knee pads for comfort as well as a drain plug to get any accumulated water out after you’re done. It also has shock cord rigging for storage and carries handles at the bow and stern. It has a weight capacity of 220lbs. The Axis 10.5 is meant for kayakers with a broad taste in kayaking and can handle everything from a leisurely day on a lake to running rivers and waterways. This diversity in its capabilities makes it great for those just starting out with whitewater kayaking. In fact, in 2009 it was named the best piece of adventure gear by National Geographic Adventure. It has great responsiveness for flowing water due to its defined chine as well as its optimized rocker than improve its maneuverability. The height-adjustable drop skeg also gives you directional control by ensuring that it tracks properly. The cockpit comes fitted with ConTour CFS-R seating, which is a soft foam seat, as well as an adjustable backrest with a modifiable height, protective pads for the thighs and knees, and SlideLock XL foot braces that are adjustable according to your height. Comfort is supplemented by the utility through its multiple storage spaces. It also has a handy bottle holder. It has a stern hatch for cargo as well as bungee deck rigging and a mesh deck cover with bungee to stow equipment that you might need to quickly reach for. The maximum weight capacity of 300lbs. Most users consider it suitable up to class 2. 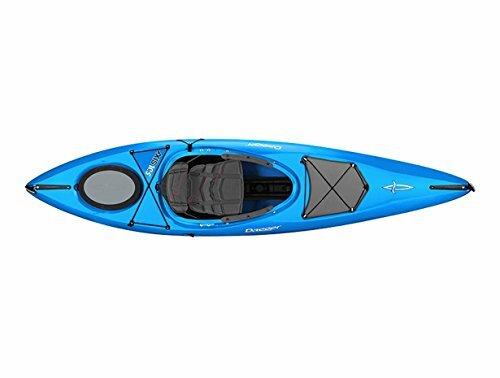 While the previous inflatable kayaks on this list have been meant for tandem kayaking, the Rover 120 is meant for solo trips, either for leisurely days on a gentle lake or more adventurous thrill-seeking on rough whitewater. It is made of reinforced and layered PVC for durable double-layer protection. This construction enables the kayak to safely bounce off rocks and other obstacles without any fear of puncturing. It also has a high-pressure drop-stitch floor that gives it the feel of a hard kayak by providing rigidity, responsiveness, and stability. These two features, combined with its river-runner outline, allows the Driftson 120 to tackle Class III and even Class IV rapids. It also comes with a removable skeg that improves tracking in flat water and can easily be taken off for whitewater. It also comes with self-bailing drain plugs which drain water out of the cockpit while kayaking in rapids. Other features for comfort include a padded seat with high back support, an aluminum paddle with an ergonomic grip and an adjustable footrest. You also get a hand pump, front camera mount, and travel carry bag with it. The maximum weight limit is 300lbs and it weighs just 22lbs. This is the tandem version of the previous kayak and is the more popular of the two. It can seat two adults as well as a child, which makes it great for families. The adjustable footrests make it good for family members of all sizes. It is made of reinforced and layered PVC and a puncture-resistant tarpaulin bottom. These materials are both durable and lightweight and the Rover 220 weighs on 28lbs while having a weight capacity of 600lbs. 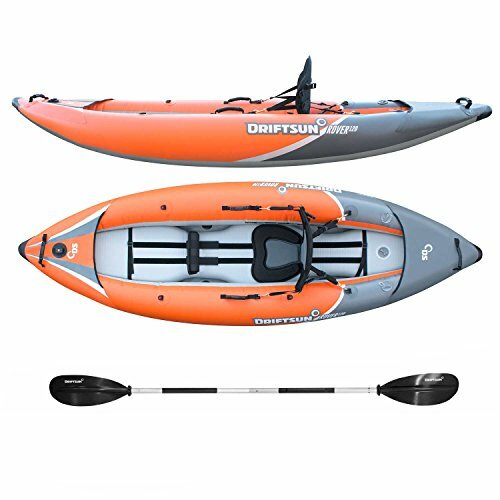 Its drop-stitch floor gives it rigidity while its several self-bailing plugs drain rapidly drain water that splashes into the kayak. These features make it great for white water rapids up to even Class IV. In case you want to use this in flat water instead, you get a rear tracking skeg to give you directional control. It comes with its own hand pump for quick, 10-minute inflation along with aluminum paddles with ergonomic grips and its own travel carry bag. This inflatable kayak by Swimline is a convertible model that can toggle between solo and tandem kayaking. The interior is built of a sturdy 22-gauge PVC which has a tough PU-coated nylon cover on top. The bottom is similarly covered with nylon. This gives it a high-pressure floor that remains strong, stable, and rigid in whitewater. It comes with nylon-covered adjustable bucket seats that can be removed and sports high-pressure Boston valves to quickly inflate and deflate it. The tracking of the Solstice is improved by a removable skeg fin. For storage, you get a couple of D-rings to attach equipment to while the fore and aft are covered with bungee cords in case you need to quickly reach for a stored item. A carry bag for the deflated kayak also comes with the purchase. It has a weight limit of 440lbs. If you are going to give whitewater kayaking a try you want to make sure you have the best whitewater kayak for beginners. Choosing the best beginners whitewater kayak is similar to choosing the best beginners kayak in general. These 7 kayaks are great for every type of kayaker: whether you want to go solo, in tandem, or with your family. Whether you want a hard-shell for frequent kayaking or just an inflatable that you can store away for most of the year, this list will have a good option for you.